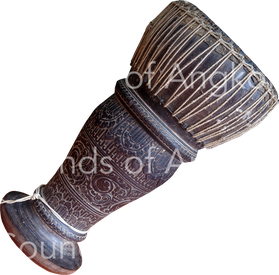 Goblet drum - Site de soundsofangkor ! 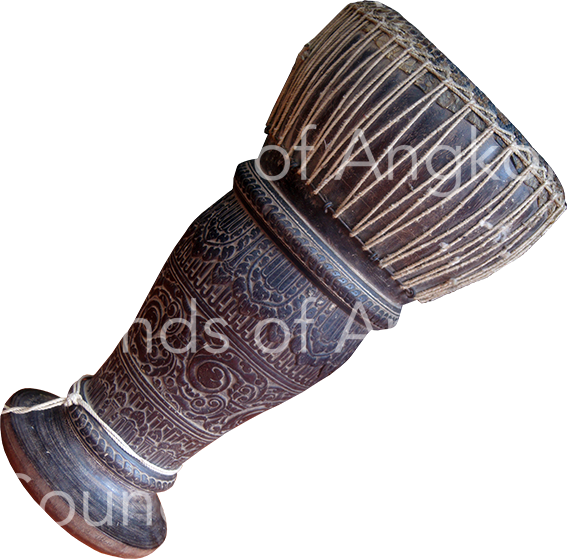 In Cambodia, goblet drums are single headed with a laced membrane head. Today they are made of wood but formerly they ware in pottery too. On the sculptures they never appear in totality because the foot of the instrument is always concealed between the thighs of the musician. One of the most beautiful representations once belonged to a high-relief lintel of the Wat Baset (Battambang), today at the Musée Guimet. It is a Reamker scene. One sees perfectly the flared head of the drum along which run the ties of tension of the skin, the lower and upper rings around which turn the ties as well as the carrying device around the waist. Scene of the Reamker. Two monkeys play a goblet-drum, a cylindrical drum and a trumpet. Origin from Wat Baset. Late 11th - Early 12th c. Musée Guimet, Paris. A scene from the Reamker (1) of the north-west corner pavilion of Angkor Wat also shows two monkeys playing this drum. 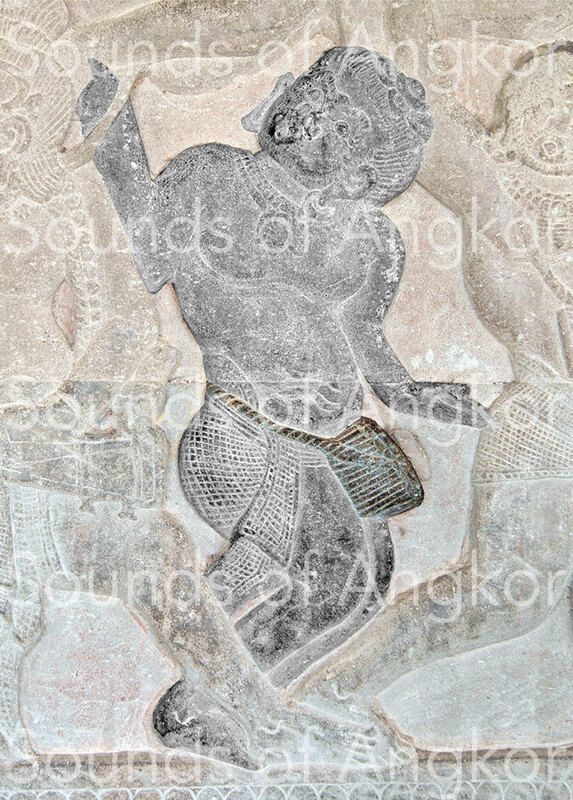 In Angkor Wat, in the scenes of the Battle of Lanka (2), some of these drums appear in a war situation, with the same carrying device. 1. Two monkeys facing each other strike drums alongside conchs and cymbals. Angkor Wat, northwest corner. 12th c.
2. 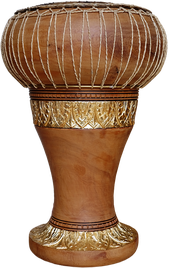 Goblet drum. 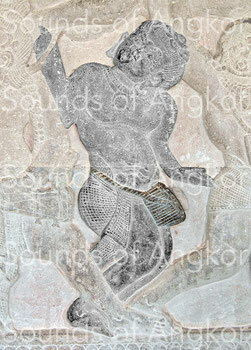 Angkor Wat, Battle of Lanka, west gallery. 12th c.
3. 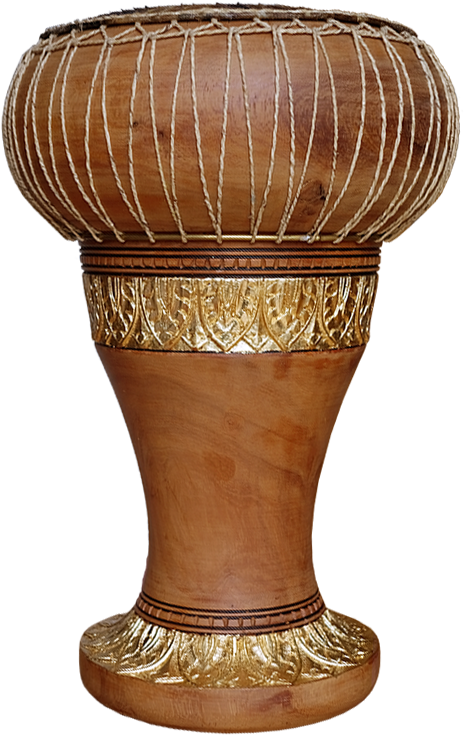 Goblet drum with waist belt. Angkor Wat, north gallery. Battle of Asura and Deva. 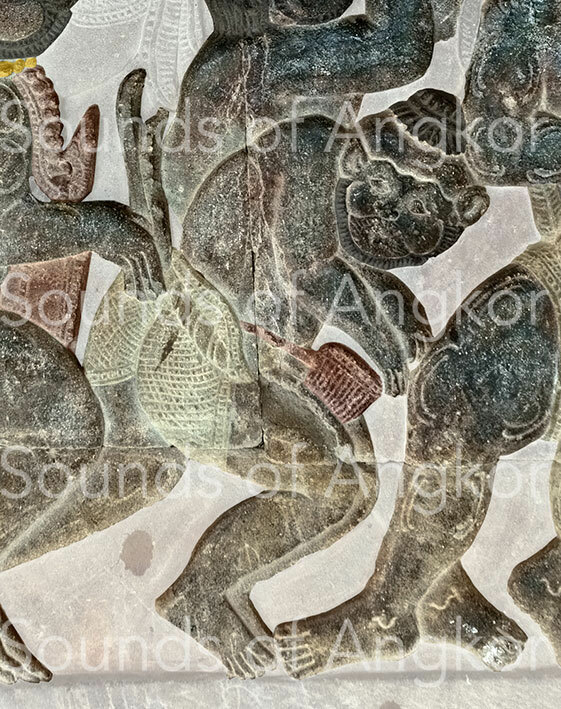 12th c.
In Cambodia, the wooden skor daey, formerly commonly made of clay, is the descendant of Angkorian iconographic representations. There are, however, other goblet drums in this country with differentiated shapes for various uses (skor thon, skor areak, skor chaiyam). Carved goblet drum in wood. Cambodia. Wat Bo collection. Siem Reap.